Spyro the Dragon is one of the most beloved characters from the early days of Sony’s entry into the console gaming market. The little purple dragon has burned within the hearts of gamers since his debut on the original PlayStation in 1998. 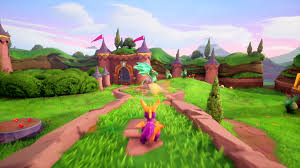 Now, Spyro returns in a glorious remaster that shows the beauty of the Dragon Realm while keeping things simple. See Spyro in all his purple dragon majesty in the launch trailer for Spyro Reignited Trilogy, which collects all three PS1 titles into one amazing package. The game releases for PlayStation 4 and Xbox One on November 13, 2018 to commemorate the 20th Anniversary of Spyro’s birth.